June is in transition, reeling from her divorce and trying to stay sober. She returns to the Oregon coast where she grew up, and must decide what to do with her late and much-loved grandparents’ charming cedar-shingled home, a place haunted by memories of her childhood. Jameson comes highly recommended to renovate the old house to sell, and from their first contact, he senses a connection with June. He too is unmoored as he struggles to redefine his marriage in the aftermath of loss. But what can the future hold as long as they are gripped so firmly by the past? The Days When Birds Come Back, like the house itself, is a graceful testament to endurance, rebuilding, and the possibilities of coming home. 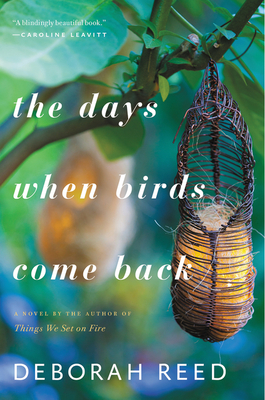 DEBORAH REED is the author of four novels: The Days When Birds Come Back, Olivay, Things We Set on Fire, and Carry Yourself Back to Me. She has written two popular thrillers under the pen name Audrey Braun. Reed holds an MFA in creative writing from Pacific University and is codirector of the Black Forest Writing Seminars at the University of Freiburg in Germany. She lives on the coast of Oregon.